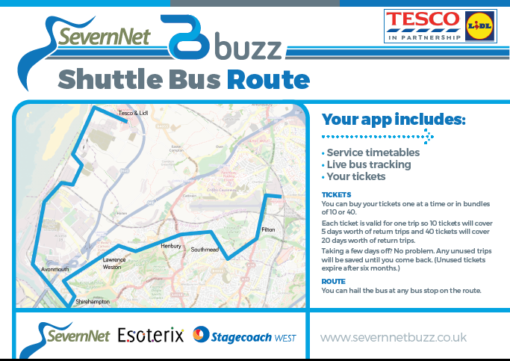 This service has been developed with and for Lidl and Tesco, in partnership with SevernNet, Esoterix Systems and Stagecoach West. It will be running twice a day, seven days a week (except Christmas Day) for the Morning and Back shifts. The service will be connecting colleagues from Lidl and Tesco at Western Approach with Little Stoke, Filton, Southmead, Henbury, Lawrence Weston, Shirehampton and Avonmouth. 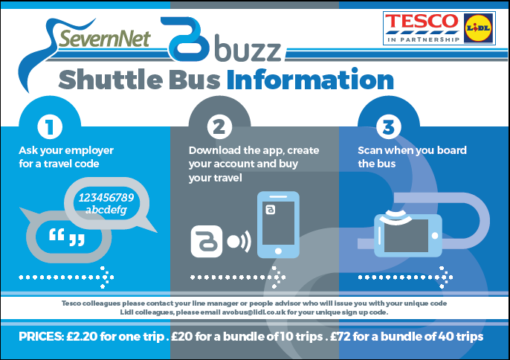 The SevernNet buzz is a cashless service and tickets must be bought in advance. Lidl and Tesco colleagues can buy tickets in advance via the severnnetbuzz app. The tickets are £2.20 for one trip, £20 for a bundle of 10 trips, £72 for a bundle of 40 trips. To enquire about working with Lidl check out their careers page and then search by location, for example Severn Beach. Similarly check out Tesco’s careers page here. If you’re a local employer and you’d like to learn more about this service and how you can ‘get on board’ for your colleagues please get in touch with Kate Royston on 07969 569 444 or email.